… I know it may seem a little early to be thinking about Christmas but in fact we’re only a few weeks off now and I have to prepare for the Lincolnshire Food and Gift Fair which is at the Lincoln Showground on December 2nd and 3rd and I feel very honoured that i’ve been asked back to cook in the Lincolnshire Kitchen demo theatre for a 3rd year. Which of course I’m very excited about. I love doing shows like this and i’ve learnt so much over the years about how to cook under pressure, what the audience really wants from you, how to prep in advance and making sure I include a little bit of theatre and i thought i’d share some pearls with you today. Cooking under pressure: So firstly, learning to cook under time pressure is all about splitting the cooking time and chatting time equally. This year, I have a 40 minute slot in the show kitchen and so i’m planning to spend half the time actually cooking, leaving half the time to have a little banter with the crowd. Inevitably you get asked some very odd questions and answering them can often take time so you don’t want to be mid conversation whilst something’s burning in a pan. I also find that to ease my nerves, getting the audience on your side is a good idea. So before you start to cook, have a little conversation. I usually chat about Christmas, what i’m cooking for Christmas lunch, how many people are going to be sitting around the table, that kind of thing… and I like to throw it out to them too. It helps you link with the audience so you can come back at them later if you need to. I also always find that they love it if something goes wrong. It makes you more human. Preparation: Of course this leads neatly on to preparation, which as you can imagine is probably the most important part of the demo. If you have everything planned out, in stages, then even the most complicated dishes can be achieved. 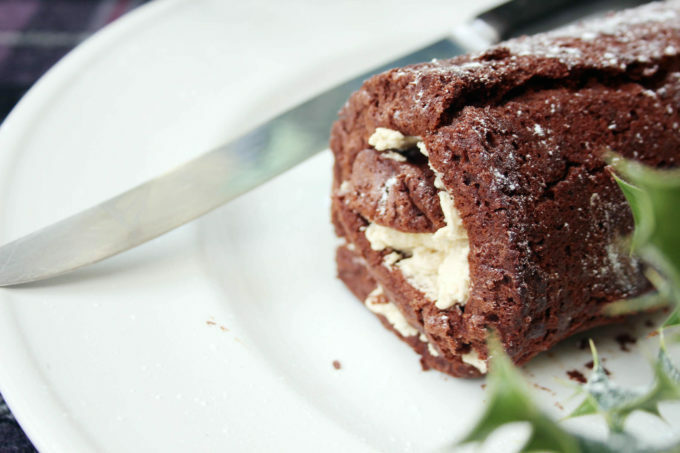 I’m going to be baking a chocolate roulade this year, for reasons that I will explain shortly, and this may seem like a tricky and complicated sig but actually it’s pretty simple, has 3 stages that I can easily explain and simple ingredients I can prepare in advance. I alway have everything ready to go but not weighed out as I like to show people the stages. I also always have a few completed stages of the bake so I can move on to each stage without having to wait for the bake – this may seem obvious but unless you think about it it can cause a lot of issues. Falling back on the old Blue Peter trick of having ‘one i’ve prepared earlier’ is always important if you’re baking. Pleasing the audience: Next we need to think about what the audience wants. I’ve learnt over the years that you may have an idea of what would make the perfect Christmas demo but actually what the audience really wants is chocolate. It’s as simple as that really. They want chocolate dishes and they want to try stuff. Which is why preparation and pre-made sides is always a hard and fast rule. I will spend the Friday prior to the event cooking at least 2 chocolate roulades so that everyone in the audience can sample the final dish. A touch of theatre: Whatever you’re cooking, adding a little flair is always a great way to draw the audience in. With this roulade I have to do the final roll up at the end. it’s something that’s perceived as tricky but i’ve done it enough times to be confident with it… but I like to play on the trickiness aspect just for a bit of flourish – and if it goes wrong, then see above. They’ll love you for it! 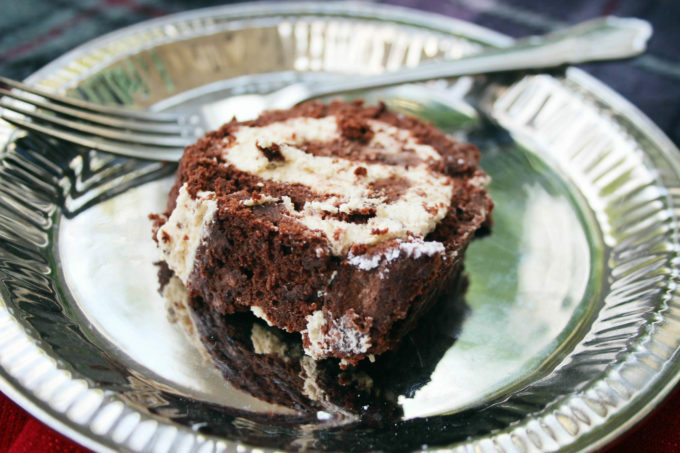 I’ve actually made this roulade a number of times on this blog but I think it’s worth coming back to because it is phenomenal and I have found it pretty fail safe. It can also (and in fact needs to be) prepared in advance and can be frozen so I think it’s pretty much stress free. It’s a great alternative to christmas cake or christmas pud and obviously works as a Yule Log too… but just a cooler version I think. The other thing I love about this roulade is that whilst it’s incredibly rich it’s also light and airy, which is exactly what you want after a really filling meal. It’s also naturally gluten-free which is a bonus. 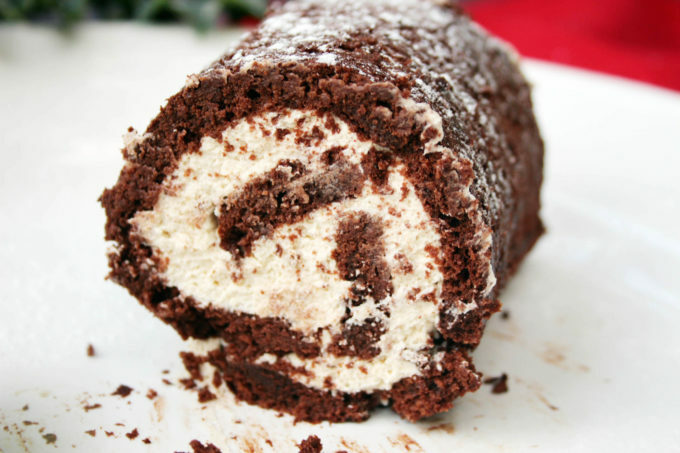 But… the very very best thing about this roulade is the chestnut cream. I could literally (and in fact have) eat bowlfuls of the stuff. It’s very simple, just softly whipped double cream with added chestnut puree but it’s the sweetened chestnut puree that works its caramelised magic in this… but you must get the sweetened kind. I use the Clement Faugier Chestnut Spread which is available on amazon but I also find it at my supermarket closer to Christmas. in a large bowl, beat the yolks with the sugar until soft and light. next, melt the chocolate (I do this gently in the microwave but if the idea sends shivers up your spine, then use the classic bowl over simmering water method…) at this stage add 1 and 1/2 tablespoons of hot water to the choc mix, then stir it gently into the egg and sugar mix. now beat the egg whites till stiff and then carefully fold them into the chocolate and egg mixture. pour the mixture into the tin and bake in the oven at 160C for 20 minutes then a further 10 minutes at 90C. whilst it’s baking, grease another large sheet of foil and place it on a flat surface where it won’t have to be moved for a while. Now the tricky bit… Once baked, take it out of the oven and immediately turn it over onto the greased foil and leave it, with the baking tin still on top for at least 8 hours… so bake in the morning and get on with life, or bake in the evening and leave it overnight. Take off the baking tin and carefully peel off the foil that lined the tin. Spread the cream mixture evenly onto the surface of the roulade and then, using the excess foil, roll the roulade into shape. It should be able to be slipped neatly onto a plate. 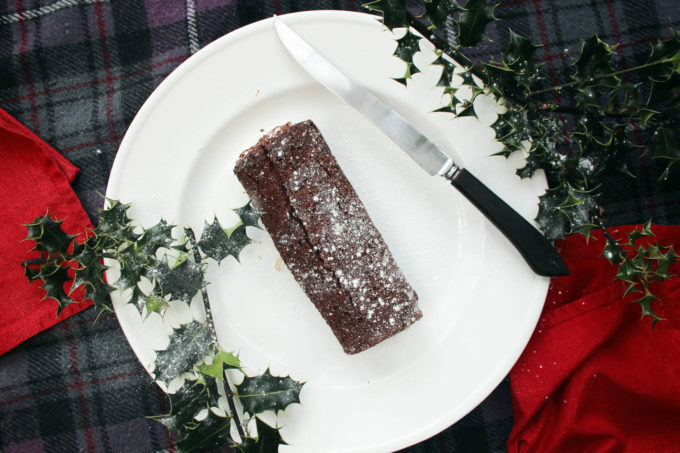 Sprinkle with icing sugar for a classic Yule Log look and then don’t forget to eat and of course, enjoy! Planning for Christmas is one thing but the retail extravaganza starts way too early for me. The pressure to overspend in order to have “the best Christmas ever! ” annoys and saddens me but I know I’m in the minority! This looks gorgeous and it would be a shame to make it only at Christmas! agree it all starts too early… I had to write my Christmas recipe for Lincolnshire Life Magazine in September!! The roulade looks so good~ Thank you for the recipe! Gonna try it this weekend! do try, would love to know how it turns out!